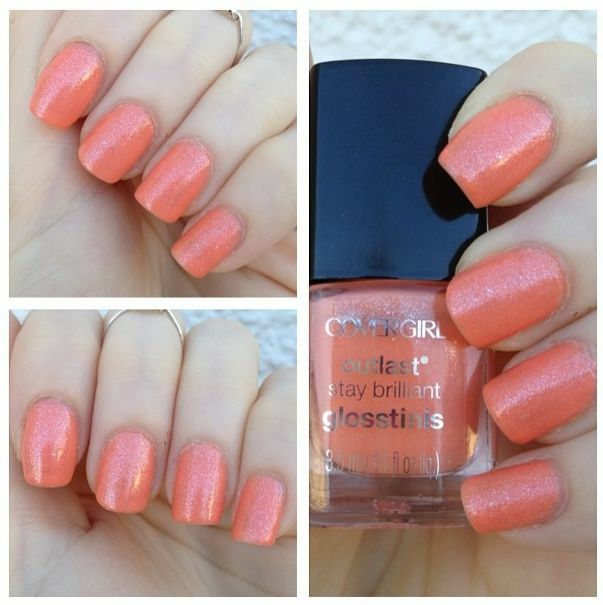 Three coats of CoverGirl Outlast Stay Brilliant Glosstinis in Bahama Mama. Peachy Pink with Silver Shimmer Throughout. The lowdown: Bahama Mama is, essentially, the love child of L'Oreal's Versailles Romance and China Glaze's Mimosa's Before Mani's - a fact that I am very happy about, because those have been two of my favorite nail shades of 2013. The formula on this is very sheer; however, it is incredibly easy to build, so you can achieve the opacity that you're going for with minimal effort. As far as I know, this is part of CoverGirl's Limited Edition Summer 2013 Collection; so definitely grab a bottle sooner rather than later if you're digging the color. Awesome variation. Love the balance of the pink and the peach in this. This years Megawear's mint is darker than the previous one "Refresh Mint" and I've been happy with it. Love Love the color! Sweet post. I think its time for me to find my "egg plant" from Sally Hansen. With cooler temps in the air, I like darker colors. Very pretty. Great review too. I'm always looking for the just right neon pink. I think I like wetnwild's megalast' Tulip season best! I've never tried COVER GIRL, but have been wanting too. Love the review! I have loved Essie's pastels this summer. Wow! This is such a pretty shade! And right up my budget. Ooh love this! Such a perfect shade! It's a lovely color on you dear! I definitely love the light feel of this shade! Beautiful shade Erika! I love the shimmer! omg this colour is SO pretty! Such a fun and bright colour. It's getting darker in the UK for winter now and I feel like I need such a bright nail colour. I do like this one; the shimmer to it is really pretty. I like that the color has some sparkle to it--very great for Manicure Monday!